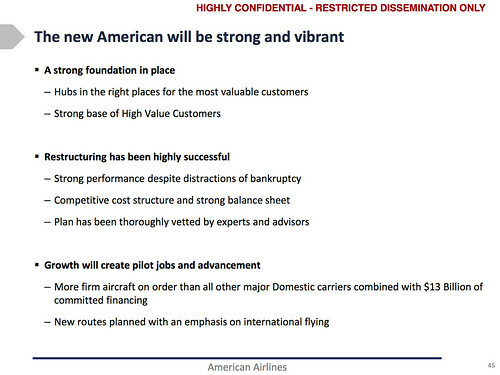 So did you see American Airlines CEO Tom Horton’s confidential presentation to pilots? 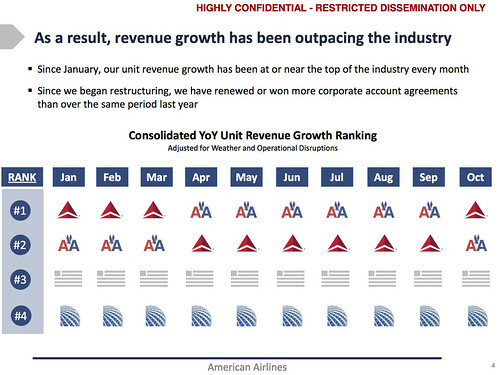 Last week American’s CEO Tom Horton met with the officers and the board of the Allied Pilots Association to outline the progress and improvements that have been achieved during restructuring process, and to describe how AA will grow in the future. 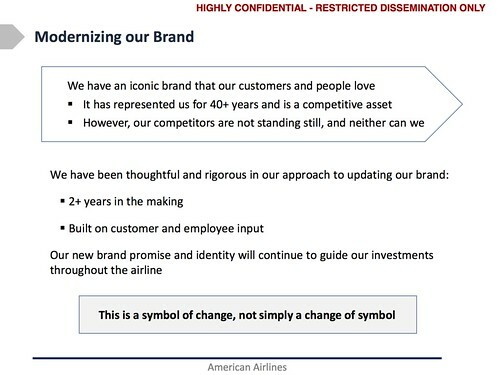 Tom outlined the strong progress and improved performance we have achieved in restructuring and outlined all of the reasons — from network and partners to fleet and products and services — American is poised to be a successful, profitable and growing company that provides more opportunity for its people. 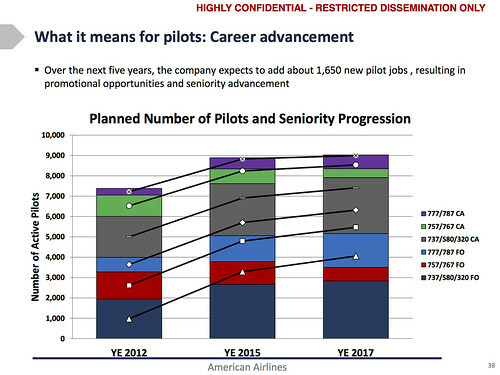 For pilots, this is growth and opportunity unseen for more than a decade. Much of the presentation is highly confidential, but it’s important for you to have an unfiltered look at the information, so we have posted to AAPilots a version that removes only the most competitive details. 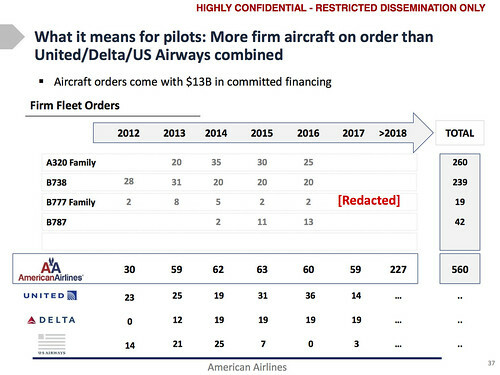 Terry Maxon, of the Dallas Morning News, posted a copy of the entire presentation on the paper’s Airline Biz Blog, and afterwards copies of the presentation started showing up in the forums and on Facebook. 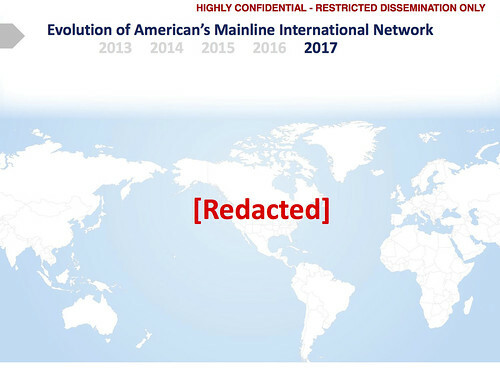 It’s 45 pages and some of it is probably of more interest to pilots or investors, but there are several slides that caught my attention. 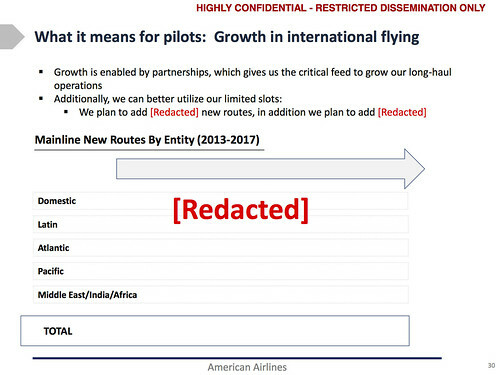 I’m intrigued by the mention of “Middle East/India/Africa” in the next slide…I wonder if AA will start (or in the case of India, restart) service to those regions? I’d love to see uncensored versions of these next two route maps! You can download an entire copy of the presentation by visiting Terry Maxon’s original post. Take a look and come back and share your thoughts. I’m excited to see what new routes will be opening up! 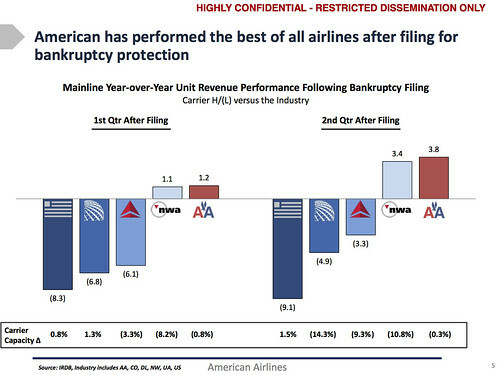 The report looks like AA is making a great recovery. Anyone else notice that Northwest Airlines was included? oops pressed send, before I could finish, but was interesting that NW did well after filing just like AA, and then got bought out. Lots of emphasis on international here, which is great, but leaves me feeling a bit empty until I know what the new routes are. I, too, got a good chuckle out of the NW logo. 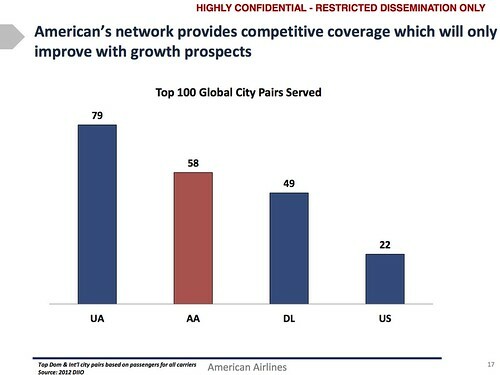 The slides also reflect how little US will do to aid AA in a merger from an international standpoint. 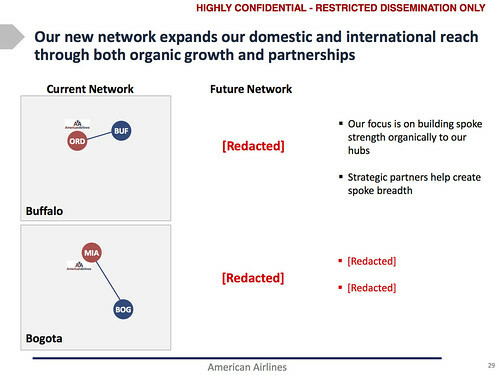 Between this and the new “don’t merge with US” blog, things are looking up for AA. Now for the new livery!